Sciency Thoughts: Eruptive activity on Erte Ale. Eyewitnesses have reported a bout of fresh activity on Erte Ale (or Erta Ale), an active shield volcano in the north of Ethiopia, during the first weeks of January 2017. Infrared cameras mounted on satellites recorded a sharp increase in temperatures beneath the volcano on 19 December 2016, with temperatures remaining high at the time of writing. The volcano was visited by a group of tourists travelling with Volcano Discovery on 16-19 January, who reported lava fountains and lava overtopping the crater, producing lava rivers on several flanks. On 21 January local residents reported a new fissure on the southeast flank of the volcano, about 7 km from the caldera, producing a significant lava flow. Lava overflowing the caldera of Erta Ale on 17 January 2017. 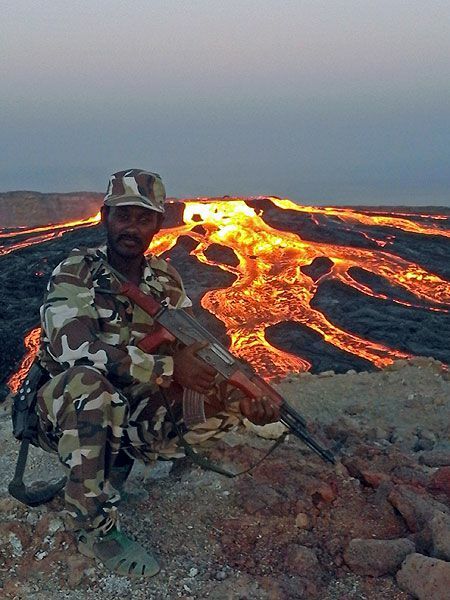 Enku Mulugeta/Volcano Discovery. Erta Ale is on the Ethiopian Rift, the boundary between the Nubian Plate and the Danakil Microplate. 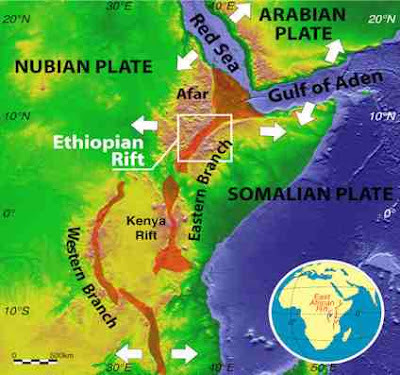 The African Plate is slowly splitting apart along the Ethiopian Rift and the East African Rift to the south (which is splitting the Nubian Plate to the West from the Somali Plate to the East). Arabia was a part of Africa till about thirty million years ago, when it was split away by the opening of the Red Sea Rift (part of the same rift system), and in time the Ethiopian and East African Rifts are likely to split Africa into a number of new landmasses. Rifting in East Africa. The Danakil Microplate is the red triangle to the east of the Afar depression at the southern end of the Red Sea. Università degli Studi di Firenze.